Retiring Your Way: Top Tips for Making the Decision to Buy or Rent Your Home…. One of the most significant choices that seniors face is where to live during their retirement years. The results of their decision about whether to rent or own may last for the rest of their lives. That’s why it’s imperative that all senior citizens be informed about the best way to make the ultimate decision to buy or rent. It’s also a good idea to start thinking about whether to pay mortgage or rent well in advance of retirement time. After spending a couple of decades raising kids and making mortgage payments on a sizable home, many people opt to downsize their living arrangements. For most folks, it makes little sense to continue paying to maintain a five-bedroom home after the kids are grown and moved away. If you have no children living with you, it might make good sense to sell your big house and buy or lease a reasonably sized flat or condominium. Opt for a second bedroom, and you can offer guest accommodations to visitors. 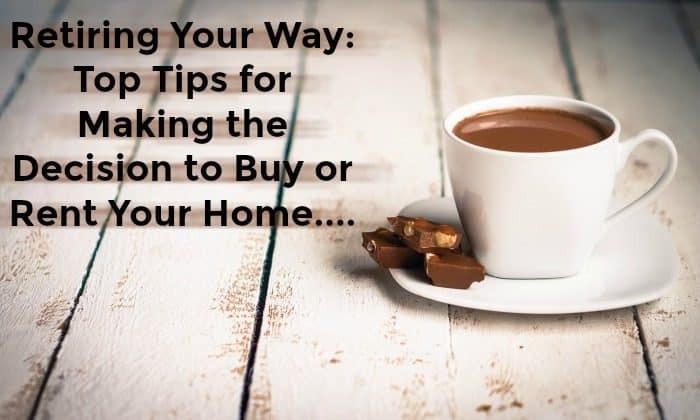 Like it or not, it’s impossible to avoid some sort of residential expense, and a decision whether to purchase a newer, smaller domicile or to pay rent to a landlord for the rest of one’s life must eventually be made. A home loan where the lender pays the borrower a lump sum or installments that don’t have to be paid back immediately is known as a reverse mortgage. If you want to know what a reverse mortgage is good for then ask yourself if you have enough money set aside for your retirement or not. If the answer is no then this sort of reverse loan can help you because you won’t be obligated to pay it back at regular intervals. Instead, you can have access to the money you need to make your retirement more enjoyable and comfortable, and the home loan balance will not be owed until you no longer live in your home for any reason. Financial experts at TheGuardian say that people who have spent the majority of their working life paying into a retirement pension plan may do well to purchase in lieu of renting, provided they completely pay off their mortgage prior to retirement. The explanation is that for someone living on a fixed pension, the cost of rent may take too much of their monthly income, whereas a person with a paid-off mortgage would likely only have to pay for property taxes and homeowner’s insurance. It stands to reason that a small monthly pension will go a lot further for someone who owns their home outright and does not have to pay monthly rent to a landlord. If you opt to buy, will you think of your home as an investment for the future? How long do you intend to live there? Home ownership can be expensive, but it does offer a sense of security that renters do not enjoy. On the other hand, home ownership binds a person to a certain location, making it difficult to to pack up and go if wanderlust strikes. Kiplinger’s notes a number of emotional as well as financial factors that ought to be considered when making the decision about whether to rent or own in the golden years. For retirees living on a fixed income, it can be a huge emotional (and financial) relief to know that their landlord is responsible for maintenance and repair. When you own your own house and something goes wrong with, say, the heating or plumbing, a professional service call can be a big, unexpected expense. Generally, one can contact the property owner if and when a rental home requires upgrading or repair. When one owns their home, an unexpected cost such as roof repair can present a major financial hardship. There are other emotional considerations to bear in mind when deciding whether to rent or own. As we age, the idea of staying in place to enjoy our retirement years can be very appealing. Even with a strong lease, a renter can be forced to move. For an older individual, moving house can be a very stressful event. Home ownership allows a person to customize their house any way they like. For many people, the option to paint and otherwise fix up their dwelling to suit their personal tastes makes the idea of owning superior to that of paying rent for the rest of their days. For savvy advice about buying and selling and renting residential property, your best bet is speak with a professional. If you happen to reside in Cardiff Bay, discover Taylor’s for all sorts of mortgage advice as well as good leads on property rentals in your area. Naomi Barry works in the real estate industry with a company that both sells and lets properties. Knowledgeable in both areas she writes property related articles for a selection of blogs. Tips for Solving the Big Downsizing Debate….